As a dog owner, part of your responsibilities is making sure that your furry friend is always in good health. One of the ways you can ensure this is by giving him a worm treatment specifically designed for dogs. Like fleas and ticks, which can be treated with a flea and tick treatment for dogs, worms can easily multiply if left unattended. The problem gets even worse since they are inside your dog. For that, you’ll have to use the best dog dewormers to purge those parasites from your dog’s body. 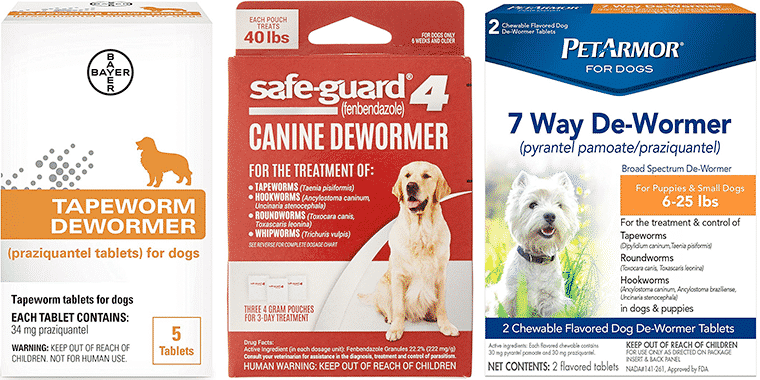 In this article, we’re going to review some of the best deworming brands on the market. But before we begin, let’s first have a look at the important factors you have to consider when buying a dog dewormer. 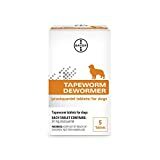 Each dog dewormer comes with a number of active ingredients which are designed to purge the worms from your dog’s body. These ingredients can be used alone or mixed with others. However, not all deworming formulae can be effective against every worm type. For example, a dewormer with fenbendazole as its active ingredient isn’t effective against tapeworms. To make sure that the dewormer you purchase has the active ingredients designed to deal with the specific parasites in your dog, you have to ask your vet about it. Ask him which particular anthelminthic is best to use on your pet. Different types of dewormers can be used in different ways. Among the most popular come in the form of chewable tablets and liquid drops. Keep in mind that each of them has its own benefits and drawbacks; therefore, you need to choose one which you think is a lot easier and more convenient to administer to your dog. Additionally, you have to consider palatability since it can actually affect the administration. If your dog finds out that the dewormer has a peculiar or awful taste, he will most likely spit it out. On average, deworming your dog will take around 2-3 weeks for it to really take effect. However, this only applies to mild infestations. If your dog suffers from moderate to severe infestation, it may take a little while to purge those parasites from his body. This is especially true if those worms have already reached his other organs including the heart, liver, even the brain. In such cases, consulting your veterinarian could be really important so he can properly evaluate other options. Deworming products are labeled in accordance with the age and weight of your dog. You can actually find a number of options for puppies who are as young as two weeks old. Meanwhile, there are products meant for dogs who are 12-weeks old and beyond. By using a dewormer specified for your dog’s age and weight, you’ll be able to increase the chances of purging those parasites successfully. First on the list is the 8in1 dewormer from Excel. Due to its effectiveness in purging worms inside your dog’s body, it can keep off any parasitic infestation in your dog for around 6 months. Moreover, it’s a huge pack, with each pack capable of treating 40 pounds, making it the ideal option if you have more than one dog. Aside from that, it’s safe to use on puppies aged 6 weeks and beyond, pregnant dogs, and even those who are infected with heartworm. It can eliminate several types of worms including roundworms, whipworms, hookworms, and tapeworms. Containing Pyrantel pamoate as its only active ingredient, the Nemex 2 dewormer from Pfizer is effective in dealing with two types of hookworms and roundworms. You can easily administer it to your puppies aged 2-weeks old and beyond as it’s available in liquid form. Moreover, it’s guaranteed to be palatable, so your dog won’t have any issues with its taste. The effect is only limited to roundworms and hookworms. It’s not capable of purging other types of worms. Safe and effective, the Quad Dewormer from Bayer Animal Health comes in chewable form to help get rid of worm infestations inside your dog while making it really easy to administer. It comes with a number of active ingredients namely praziquantel, pyrantel pamoate, and febantel. Giving just a single dose on your dog is enough to take care of the infestation problem. Aside from that, it even comes in beef flavor, so your dog wouldn’t have that much of a problem taking it. In fact, he might associate it as a chew treat. 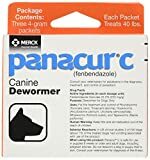 Available in powder form, the Panacur C is an effective deworming that contains fenbendazole as its active ingredient. That said, it’s really effective in dealing with a variety of worms including hookworms, roundworms, tapeworms, and whipworms. Aside from that, it’s a really excellent over-the-counter product for treating infestations in puppies and adult dogs. Although it can be administered on puppies 6-months old and above, it shouldn’t be used on sick animals. It’s best to consult your vet about it first just to be sure. Another quality product from Bayer, this one is specifically designed to deal with a tapeworm infestation. Available in tablet form, you can easily administer it to your dog as a treat or mix it along with his food. It can be administered to puppies 4-weeks old and beyond. The dosage will vary depending on the weight of your dog. For example, dogs weighing less than 5 pounds will only need half a tablet, while dogs weighing around 46-60 pounds need up to 4. 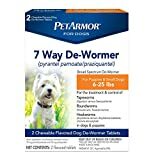 The 7-way dewormer from PetArmor is as the name implies: it can get rid of seven different types of worms at once. These include two types of roundworms, two types of tapeworms, and three types of hookworms. It’s specifically designed for dogs weighing 25 pounds and above, but you can also find an option for smaller dogs. Available in chewable form, you can administer it either by mixing it in your dog’s food or hiding it in his treats. The dewormer contains 2 active ingredients namely praziquantel and pyrantel pamoate to get the deworming job done. Another 7-way dewormer, this one from Sentry Pet Care is also effective in dealing with 7 different types of worms. It has the same active ingredients to that of PetArmors, and it’s even available in a chewable form as well. However, it comes with six different flavors which your dog will surely love. Although there’s really no specific age recommendation, the Sentry HC dewormer is intended for small dogs weighing between 6-25 pounds. Each of the chewable can treat up to twelve pounds, so the number of tablets you should administer will depend on your dog’s weight. The Triple Wormer from Durvet is an over-the-counter treatment which contains praziquantel and pyrantel pamoate as its active ingredients. It comes with 12 tablets which are designed for medium and large dogs, specifically ones that weigh over 25 pounds. As it’s available in chewable form, you can easily administer it to your dog by mixing it into his food or hiding it inside a dog treat. However, you can also choose to administer it directly; after all, each of the tablets has tasty flavors that most dog will love. Q: How can dogs get worms? A: Puppies are naturally born with intestinal worms in their body. This is because the worms inside their mother’s body were able to grow with the help of hormones that are secreted while inside the womb. These worms will then move through the placenta then enter the puppies’ body even before they’re born. Aside from that, worms can also enter a puppy’s body through his mother’s milk. Adult dogs, on the other hand, can get worms from eggs which are found in the soil right after they have defecated. There are certain worm eggs that could thrive for years in the soil. Other factors include eating fleas or eating the feces of other animals. Q: What are the different types of worms? Hookworms – this type of worm can be lethal to young puppies as they drain huge amounts of nutrients from the puppies’ body. They’re basically blood-sucking parasites which can enter a dog through his skin or mouth. Roundworms – roundworms are classified into two species: toxascaris leonin and toxocara canis. They both have long and white bodies and are capable of absorbing nutrients from their host. Dogs can obtain them upon contact with contaminated feces. If left unattended, they could grow to several inches long and can result in various respiratory issues. Tapeworms – this type of worms normally thrive in a dog’s small intestine by absorbing nutrients from digested foods. They have a flat appearance and can grow up to half a foot, sometimes even more, in length. Whipworms – compared to other types of worms, whipworms don’t absorb as many nutrients. They’re typically found in the large intestine and can enter a dog’s body upon contact with contaminated soil. While they don’t cause major problems, a whipworm infestation can lead to chronic diarrhea if left untreated. Q: What are the symptoms of worms in dogs? Unfortunately, there are some infestations that don’t show any symptoms and can only be detected if you consult a veterinarian. Dogs normally explore things using their mouth. The problem is, this exposes them to a lot of bacteria and eggs which could later turn into intestinal worms. With the right hygiene and using the right products such as a dog toothpaste or dog shampoo, you’ll be able to minimize such risks. However, it is still important to have your dog undergo deworming, especially if certain signs and symptoms start to show. With that, using the best dog dewormer is definitely a great help.